Carbon dioxide, the main greenhouse gas, is likely to be excluded from the Pearl River Delta air quality management plan for a further decade. The plan is due for renewal by the Guangdong and Hong Kong governments next year and the Environmental Protection Department is tight-lipped on whether CO2 will be included. But a source close to the Guangdong government said CO2 was likely to be excluded from the plan. “The only possible way to have the greenhouse gas included in the monitoring is Hong Kong doing it internally, setting a model for Guangdong,” the source said. Both sides are now discussing the next targets for 2020 and which emissions should be included. Hong Kong and Guangdong agreed in 2002 to reduce emission of sulphur dioxide, nitrogen oxides, respirable suspended particulates and volatile organic compounds by 40 per cent, 20 per cent, 55 per cent and 55 per cent, respectively, by 2010. The city is confident it will meet those targets, according to a mid-term review the Environmental Protection Department released early last year. But the department says Guangdong would have to implement additional control measures to meet them. Hong Kong released 45 million tonnes of CO2 in 2006, according to government figures. This equals 6 tonnes per person, or 0.1 per cent of the world’s total emission. Hong Kong’s principal source of CO2 emissions is power generation, which accounts for more than 60 per cent of the total. Green groups in Hong Kong have for years been urging the government to set an emission target on CO2. The Environmental Protection Department has commissioned a consultancy study on climate change in Hong Kong which is due to be completed by the end of the year. It will review and update the inventories of greenhouse gases in Hong Kong, characterise the impact of climate change on the city, and recommend additional policies and measures to reduce such emissions. While the city is not obliged under the Kyoto Protocol to set any reduction targets for emissions, the government pledged along with other Asia-Pacific Economic Co-operation economies in 2007 to reduce Hong Kong’s energy intensity by a quarter by 2030, with 2005 as the base year. The UN is hosting a two-week meeting with 175 countries participating, including China, to craft a new agreement to succeed the Kyoto Protocol, which expires in 2012. At a meeting between the Chief Executive Donald Tsang Yam-kuen and Guangdong party chief Wang Yang early this month, both sides agreed to jointly map out further arrangements on how to improve regional air quality. It is understood authorities in Guangdong have started to decide on the province’s emission targets for the 12th five-year plan. Chen Guangrong, deputy head of the Guangdong Environmental Protection Bureau, also hinted that the province would continue to exclude CO2 from its reduction targets. “China is a developing country; there is no compulsory obligation for us to cut CO2 emissions under the Kyoto Protocol. But we are doing it voluntarily,” Mr Chen said. Environmentalists hope the two governments will change their minds. Wang Canfa, an environmental expert at the China University of Political Science and Law in Beijing, said it was important for both governments to commit to cutting greenhouse gas emissions. The government ought to do the work itself. By palming off a review of Hong Kong’s outdated air quality objectives to a consultant, the administration has shown its disconnectedness from a critical task. This is not its intention, of course. Presumably, the government wanted to appear independent, but this was not how it came across last Friday at the “public consultation” organised by the consultant. About 450 people showed up despite having less than two weeks’ notice of an event that was held during working hours. The timing alone created the impression that the “consultation” was not being taken seriously. The crowd was told the gathering was part of what the consultant was obliged to do under its contract with the government. So, it wasn’t the government, but the consultant, consulting the people. The director of environmental protection was there to start the event, but left early. Lower-ranking officials stayed but it was a team from the consultancy firm that presented its initial recommendations and answered questions from the public. The consultant is a big international firm, although what appeared strange right from the start, to people familiar with air-quality management, was its local team’s relative inexperience in the subject. The firm had apparently invited a panel of local experts to provide assistance, and numerous meetings were held, but it appears a number of those with science and public-health backgrounds did not agree with the firm’s recommendations. Is the government an independent party to all that? Of course not. First, upon questioning from the public, it turned out that public health was not the key priority in the consultant’s brief. This was a shock to those who showed up. People naturally thought Hong Kong was finally revising the air quality objectives because current standards have become a licence to pollute and health should be the new driver. Second, the way the consultant constructed its presentation gave the impression that its recommendation on resetting the objectives was already close to the World Health Organisation guidelines, which are the most authoritative in the world in terms of health protection. The presenter said that some permitted pollutant levels would be set at WHO levels while others would be based on interim targets. What the presenter didn’t say was that there are, in fact, no interim targets under WHO guidelines for some pollutants, and what was at issue was whether the consultant recommended unambitious interim targets. The consultant also talked about costs related to its cleanup plan but did not release the details of how those costs were calculated. There were benefits, too, but the presentation was focused on costs, presumably to emphasise that clean air doesn’t come free. Not unexpectedly, almost every question from the public had to do with those assumptions on costs and benefits. The information was not released, presumably because the client – the government – did not authorise it. The inevitable happened (in fact, it had already happened the day before, when the consultant appeared before legislators): the government official present had to agree to release the information. This will happen on April 16, when the administration gives it to legislators. It was no way to organise a public consultation. Without releasing critical information ahead of time, the event was bound to fail. It was not possible to have a meaningful exchange. The consultation was an afterthought. No wonder people went away thinking it was a disaster. The consultant’s recommended revisions are unlikely to be tough enough to lead to policy changes that will dramatically clean up local pollution – such as at the roadside – in the foreseeable future. The government should have conducted the review instead of shielding itself behind the consultant. Neither the government nor its hired guns can ever appear neutral. The long-standing habit of giving critical policymaking functions to consultants does nothing to strengthen the government’s own capacity. Local politicians in Wan Chai want more pedestrian flyovers, traffic-free streets and further greening of the area after a study they commissioned found particulate matter in the district’s air at levels nearly five times higher than recommended under the most stringent world standards. The joint Wan Chai District Council/Neighbourhood Advice-Action Council study measured fine particle concentrations – known as PM 2.5 – at 15 locations in the district between December and January and found none of the readings met World Health Organisation air quality guidelines. Conducted by Polytechnic University experts, the study also discovered that up to 72 per cent of particles found in the tested air were very fine ones capable of infiltrating directly into lungs and blood systems, causing even greater health threats than more coarse “fine” particles. 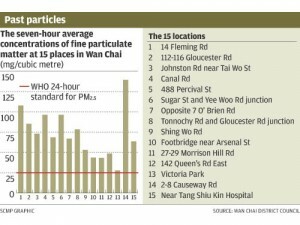 The highest reading recorded was 140 micrograms of fine particles per cubic metre in Causeway Road, compared to the WHO standard of 25 micrograms per cubic metre. Even in the city’s largest open space, Victoria Park, the reading was 30 micrograms per cubic metre. Study readings were largely in line with official air quality monitoring in Yee Wo Street, which measures only coarser “fine” particles, the study said. Daniel Chan Wai-tin, an engineering professor in charge of the study, said the chosen locations were representative of the commercial and tourism district characterised by heavy vehicular and pedestrian traffic and high-rise buildings. He said the high pollution readings were mainly attributable to emissions from vehicles and the poor pollutant dispersion capabilities of the built environment. The wall effect created by the concrete jungle had blocked the dispersion of pollutants once made possible by natural inflow of sea breeze, and increased pollution in the district, Professor Chan said. To ease the pollution, Professor Chan recommended more pedestrian flyovers and subways to separate traffic from commuters, and more planting of vegetation throughout the district. Wan Chai District Council chairman Suen Kai-cheong said the study’s findings would be useful in discussions by councillors and community members relating to ways to reduce air pollution. “The findings will provide us with some objective and scientific evidence that might help persuade different parties to come to a consensus on certain projects beneficial to the air quality that requires some changes,” he said. The study will be submitted to the government for reference. The Australian government has defended its decision to cite air pollution in Hong Kong in a new travel warning. It said a change to its travel advice for the city, highlighting the potential health impacts of air pollution, was timely as part of a “comprehensive, consistent and factual” warning. 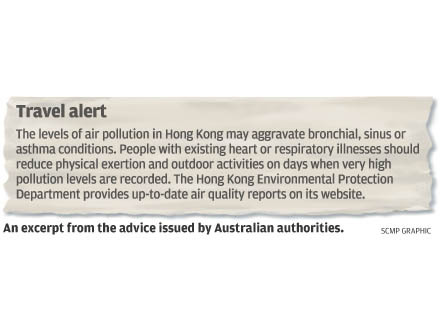 The South China Morning Post (SEHK: 0583, announcements, news) reported yesterday that Australia’s Department of Foreign Affairs had included a notice about air pollution in Hong Kong as a health issue as part of an updated alert on Monday. It warned that air pollution levels could “aggravate bronchial, sinus or asthma conditions”, and that people with heart or respiratory illnesses should reduce physical exertion and outdoor activities on days when very high pollution levels were recorded. Yesterday, a spokesman for the department said the change to the travel advice brought it in line with “similarly affected” places and used the Hong Kong government’s own health advice to its citizens. “The Australian government has an obligation to notify its citizens to circumstances that may affect their welfare when travelling,” he said. But a spokesman for lobby group Clear The Air said the advice was not up to date as it used government data that relied on old standards and did not reflect current World Health Organisation air quality standards. The WHO’s standards for measuring air pollution are stricter than those used by the Hong Kong government. The Australian government has cited Hong Kong’s air pollution as a potential health issue, in a new travel warning to its citizens. Australia’s Department of Foreign Affairs issued the updated travel advice on Monday, which is sent to all subscribers and posted on its Smartraveller website. It comes amid the ongoing debate over how air pollution in the city should be monitored and whether World Health Organisation-approved targets for pollutants should be adopted. The travel advice highlighted air pollution levels when Australians travelled to the city. “The levels of air pollution in Hong Kong may aggravate bronchial, sinus or asthma conditions,” it said. It advised visitors to check pollution levels on Hong Kong’s Environmental Protection Department website. The Smartraveller website also highlighted pollution levels on the mainland, particularly those in the industrialised areas of Beijing, Shanghai and Guangzhou. Although the site suggests the bad air may “aggravate bronchial, sinus or asthma conditions”, it does not offer advice to travellers to avoid activity. Air-quality concerns regarding seasonal haze in Singapore and Thailand are also included. A spokesman for the Australian department said the travel advice was changed during quarterly updating. Last night he could not say why air pollution was now included, when it had previously not been. Clear The Air chairman Christian Masset said the warning made it clear that Hong Kong’s air quality was no longer just a local issue. He said the warning could shame the city into acting faster to reduce fine particles known as PM2.5 and to phase out diesel engines, which he said would be “a good thing”. He said tourists should be warned about pollution as it was “a fact”. “They should be warned they might not see the harbour from The Peak. The tourists who have been fortunate enough to come when the wind was blowing the right way have nothing to complain about, but for others it might make them think twice about coming to Hong Kong. A spokesman for the Environmental Protection Department said pollution levels varied and normally did not affect residents’ and visitors’ daily activities. He said roadside levels of respirable particulates, nitrogen oxides and sulfur dioxide had fallen by 21 per cent, 23 per cent and 19 per cent respectively since 1999. The 2008 Lonely Planet travel guide said air pollution was “perhaps Hong Kong’s most pressing environmental problem”, causing up to 15,600 premature deaths each year. Yesterday’s air pollution index was medium to high, with the Mong Kok roadside station recording the highest reading of 73. Permanent Secretary for the Environment Anissa Wong Sean-yee chaired the Hong Kong advisory panel on “Review of Air Quality and Development of a Long Term Air Quality Strategy”. But she walked out of the “Air Quality Objectives and Strategy Public Consultation Forum – the Opportunity for the General Public to Express their Views and Concerns”, held on March 20, after her speech, without hearing the views of the public. Can the government explain why? Lawmakers criticised the government yesterday for setting its targets for meeting World Health Organisation air quality guidelines so low, and for lacking a timetable for implementing them. Their comments came at a meeting of the Legislative Council environmental affairs panel to discuss a report on the air quality objectives review, released last week. Democrat Lee Wing-tat said many measures suggested in the review had been discussed for years, such as the electronic road-pricing system and low-emission zones. “Has the government really decided to implement these measures? Otherwise, improving air quality will only remain empty talk,” he said. Mr Lee also criticised the administration for choosing the lowest interim targets, and for dragging out the process. Another Democrat, Kam Nai-wai, said the government justified the adoption of the least stringent standards by scare tactics, such as saying that electricity charges would rise by 20 per cent if half of the city’s power was generated by using natural gas. He quoted a petition by Friends of the Earth that said all the measures would bring a health benefit worth HK$61.4 billion, which outweighed their cost of HK$28.5 billion. Secretary for the Environment Edward Yau Tang-wah said pollutants such as carbon monoxide and lead would be controlled by the more stringent sets of standards. The review suggested Hong Kong should adopt the least stringent of the WHO’s three sets of guidelines for sulfur dioxide and ozone, but relatively tougher limits for respirable suspended particles. The consultant will complete a draft report in June after gathering views at a public forum today. Hong Kong has been advised to adopt the minimum targets of World Health Organisation air quality guidelines, officials said yesterday. They were unveiling the outcome of the air quality objectives review conducted by its consultant since June 2007. The review aimed to update the standards unchanged since 1987, with reference to the WHO guidelines issued in 2006. Compliance with the WHO guidelines could cut hospital admissions caused by air pollution and increase the average Hongkonger’s lifespan by around nine hours, they said. But the officials failed to offer either a timetable for meeting the targets or a road map for going beyond that, saying issues about the pace and willingness to pay for clean air measures would be left to the public to decide in a consultation later this year. According to the review findings, Hong Kong should adopt the least stringent of the WHO’s three sets of guidelines for sulfur dioxide and ozone but relatively tougher limits for respirable suspended particles. The consultant also proposed introducing a limit for fine particles known as PM2.5, which were believed to be more detrimental to health than heavier particles. A total of 19 first-phase measures, including increasing the use of natural gas, were identified as helping to meet the new objectives. There were another 17 measures for longer-term targets. Among these early measures, the most cost-effective was bus route-rationalisation. However, the early retirement of old diesel vehicles delivered most benefits. The officials estimated that electricity charges would rise by 20 per cent if half of the city’s power was generated using natural gas. They also estimated that bus fares would increase by 15 per cent if all old buses were phased out. However, a green group described the estimates as “scare tactics”, saying it was being used by the government to justify adoption of the least stringent of the WHO’s three sets of standards. “The only purpose of these figures is to scare the public. But it has failed to take into account the health cost of pollution,” said Edward Chan Yue-fai, campaigner for Greenpeace. Full compliance with the new objectives could save 4,000 hospital admissions a year. 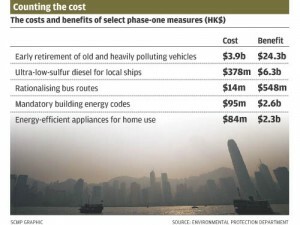 The estimated minimum cost of implementing the measures was around HK$28.5 billion. A senior environment official yesterday declined to give an estimated time frame for meeting the objectives. The official said the pace, priority and price of the measures would be clearer after collecting views from a public forum on the review next Friday, and they would become the core questions in the final public consultation to be launched in the summer. “The targets are ambitious and there is a lot of work to achieve them. But we will definitely speed them up,” the official said. The official also said that no country had adopted the most stringent targets and it was believed a “progressive” approach towards meeting the long-term goals was more preferable. The officials also warned that power plants might be unable to renew their licences while new infrastructure projects would not be able to go ahead if some unachievable targets became the criteria for environmental impact assessment. They said “more radical measures” were required in both Hong Kong and Guangdong if the targets were to go beyond the proposed air quality objectives. A confession: each time I read or hear the words “climate change”, I mentally switch off. It wasn’t always this way; I am environmentally sympathetic by nature and a firm believer in sustainable development. The problem is that scientists seem to have signed a pact to outdo one another in offering bad news about global warming. There would seem to be no need to read their research; the general message is worsening doom and gloom, and that urgent action is necessary. Headlines about increasingly severe weather patterns no longer faze me – they are expected. Accounts of islands disappearing beneath rising seas, greater levels of fresh water salinity, worsening droughts and shrinking ice caps do not surprise me. Rising temperatures mean an increase in diseases; this is new? Tell me I am not the only one who feels this way. There are many people who think differently, of course. They are the ones directly affected – and there are at least 2 billion of them. The way to unglaze my eyes is clearly to personalise the issue. If my doctor were to say I had a severe case of climate change that could well prove terminal if the prescribed medication was ignored, my outlook would be different. One of my office colleague’s views certainly are. He nodded in enthusiastic agreement yesterday when I showed him a warning by US senator John Kerry that deferring potentially costly actions to combat climate change because of the global economic crisis amounted to “a mutual suicide pact”. A resident of Tai O village on Lantau, he knows first-hand about climate change. Exceptionally heavy rain that caused landslides last June cut the only road to the town for two weeks and wiped out three of his favourite walking trails around Shek Pik reservoir. Spring tides are beginning to creep into the village’s low-lying streets, while hundreds of residents were evacuated during the storm surge from Typhoon Hagupit in September. From my North Point lair and Quarry Bay office, climate change is not apparent. Besides, governments claim that they have the matter in hand. US President Barack Obama’s billion-dollar low-carbon packages have been much applauded, as have his plans for a cap-and-trade scheme for the greenhouse gases blamed for global warming. Environmental concerns are high on the agenda of next month’s Group of 20 leaders’ summit in London. Its core task is stabilising the global economy and co-ordinating rescue efforts, but energy efficiency, renewable energy and green technologies will apparently feature among solutions. Falling energy consumption as a result of the financial meltdown also means that levels of harmful pollutants are falling. The big picture seems rosy, but my colleague and others at the cusp of the problem are not so sure. Many of the fiscal stimulus packages that aim to create employment do not seem to have the environment in mind. Premier Wen Jiabao’s work report to the National People’s Congress conspicuously gave it the lowest of priorities. Non-governmental groups dedicated to environmental concerns are feeling the funding pinch. So, how to turn attention to matters climatic? All those grim reports from this week’s International Scientific Congress on Climate Change in Copenhagen are not doing the trick for me. Nor is concern about a meaningful successor to the Kyoto pact, being hammered out in December, spurring me to write letters to politicians; I know that there is a giant disconnect between their rhetoric and actions. Broadly, it is the responsibility of the world’s leaders working together for the common good, but at a grass-roots level, it is local governments that should be taking the lead. In an economic downturn, helping people at risk has to be a priority – but this does not mean that an important constant, environmental protection, should be pushed into the background. The two have to be combined by building high-speed railways rather than roads and airports, constructing “green” buildings, encouraging firms dedicated to alternative energy and perhaps above all else, educating. Oh – and my colleague would like to see his trails rebuilt, and a sea wall for Tai O put up. A third of the experts overseeing a government review of air quality objectives believe the standards it is proposing to adopt will not safeguard public health. Campaign group Friends of the Earth polled 15 members of the panel of advisers ahead of a meeting today, at which consultants will present the review’s initial findings. Hong Kong’s air quality objectives have not changed since 1987. The World Health Organisation has proposed three new sets of standards. Of these, Hong Kong is proposing to adopt, as an interim step, the least stringent set. Critics say these are aimed at developing countries, not wealthy places such as Hong Kong. Clean-air advocates expect the consultants to stick largely to the government’s plan today. Asked if they agreed the minimum WHO standards were insufficient to fully protect public health, five of the advisers said that was so. Three are professors of medicine. The rest of the panel members would not reply or offered no clear response. Among these are businessmen and representatives of the transport and logistics sectors. Wan Chi-tin, a senior executive from Hongkong Electric, told the green group that he supported practical steps to improve air quality in the next five to seven years but would not say whether he considered the standards adequate. Hahn Chu Hon-keung, environmental affairs manager of Friends of the Earth, feared some panel members would put the interests of their own sector ahead of the public’s.